I forget sometimes how fun bowling can be. I just don't do it very often to remember in between. 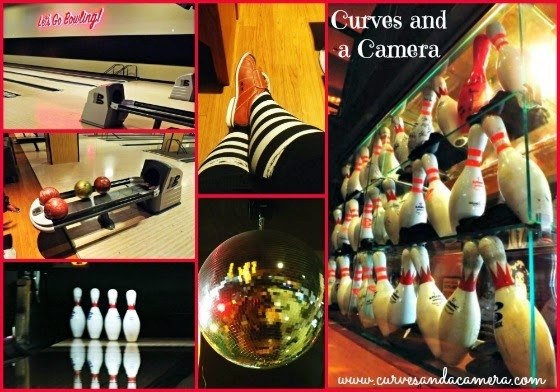 But every time I go I always have a lot of fun (and not because I'm a good bowler. I don't think I've ever broken 100). So earlier this summer my staff decided we needed a little team-bonding and scheduled a "staff retreat". We've done a variety of things in the past - from pedicures, food tours, laser tag, glow in the dark mini-golf, etc. So this time I suggested bowling! Yes, those are my black and white stripped knee socks with red and black bowling shoes...stylish no? My boss found a Groupon for 2 games at a really fun local bowling alley. I mean anyplace that has a disco ball and plays Elvis and Green Day is aces in my book. So "The Boss", "The Betty", "The Doctor" and "The Beauty" all strapped into our rented shoes and bowled our hearts out. No one got over 100....but we had an amazing time.